Anticipated 2019 Debt Ceiling Debate Fuels Fears Of "Major Market Disruption"
With Washington DC in disarray over the government shutdown battle playing out between the Trump administration and Congress, veteran traders have started to worry about what it might mean for Capitol Hill's next battle; the early March debt-ceiling reinstatement, reports Bloomberg. If an agreement can't be reached in less than 90 days, the Treasury will need to resort to extraordinary measures in order to meet America's obligations. "This shutdown episode is important because it’s a window into the governing dynamics next year, which is concerning because the debt limit comes back into play," said Isaac Boltansky, a senior policy analyst with investment advisory firm Compass Point. "Legislative brinkmanship takes on a whole new market dynamic when it encompasses the debt ceiling. We are going to have a concentration of political risks that investors need to be aware of." With the government just hours away from a partial shutdown if they can't pass a stopgap funding bill that includes $5 billion for President Trump's highly anticipated border wall, and Trump warning on Friday that a shutdown "will last for a very long time" if the wall money doesn't appear, the prospect of productive negotiations over the debt ceiling appear quite low. Senators from both parties have signaled that even modified legislation which includes the $5 billion won't pass when the chamber returns on Friday for another vote - meaning nine out of 15 government departments will shut down after Friday if there is no resolution. 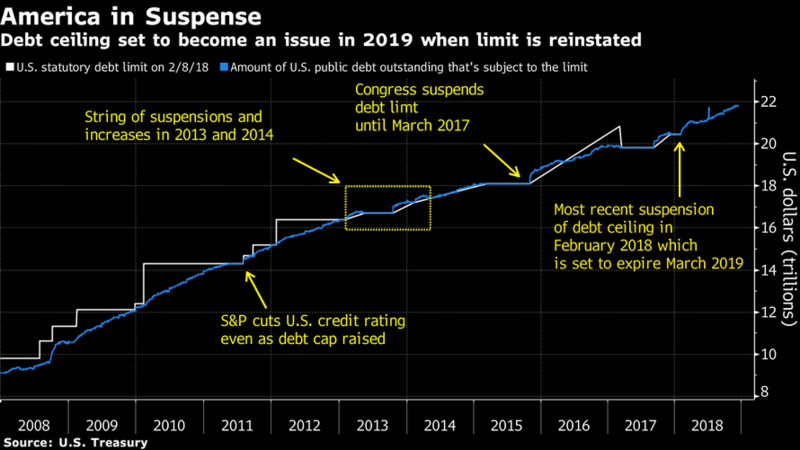 As Bloomberg notes, a similar debt ceiling debate in 2011 involving a split House and Senate "took the debt-limit debate down to the wire," resulting in American's sovereign credit rating taking its first hit by S&P Global Ratings. Yields on the 10-year Treasury slid over 3% to a then-record low of around 2% as investors counterintuitively kneejerked into government bonds right around the August 2 drop-dead date. Amid the chaos, the S&P 500 fell around 20%, while the Bloomberg Dollar Spot Index surged right after the downgrade. "Given the political setup, unlike when we had a Republican Congress, we have increased risk around the possibility of going beyond the debt-limit suspension deadline, and Treasury having to use extraordinary measures," said Moody's Senior Credit Officer, William Foster, in reference to the accounting measures employed by the Treasury to free up funds for short-term purposes and remain under the statutory limit. "That’s what we are focused on, past the temporary shutdown, is the material risk around the debt limit." 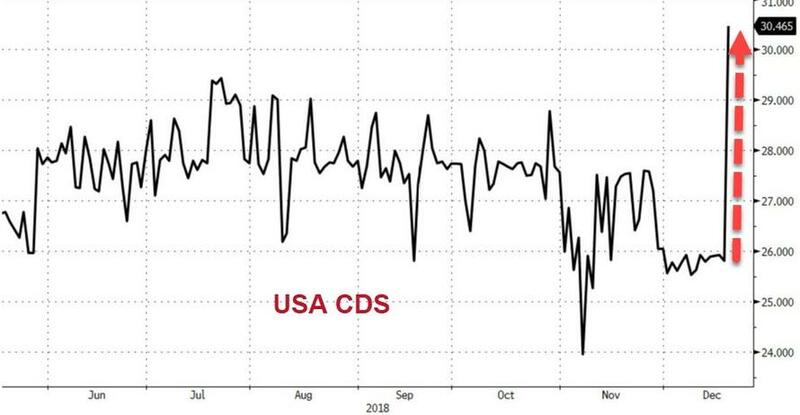 Meanwhile, US sovereign risk has spiked amid the shutdown and debt ceiling concerns. If a similar battle plays out over the debt ceiling in early 2019, some strategists predict that the US Dollar and Treasurys won't act as safe havens again, given improved economic conditions elsewhere, according to BofA's head of global rates and foreign-exchange strategy, David Woo. "The markets had to literally instill fear in politicians," said Woo. "The first six months of 2011 was the most volatility in foreign exchange and rates that I remember in the last 10 years. Given we potentially go into a turmoil situation, there is clear downside risk to the dollar as, unlike before, people will look to other havens." The yen, at around 111 per greenback, will strengthen to 109 by June and 105 by December, Woo predicts, while the Swiss franc will also benefit. 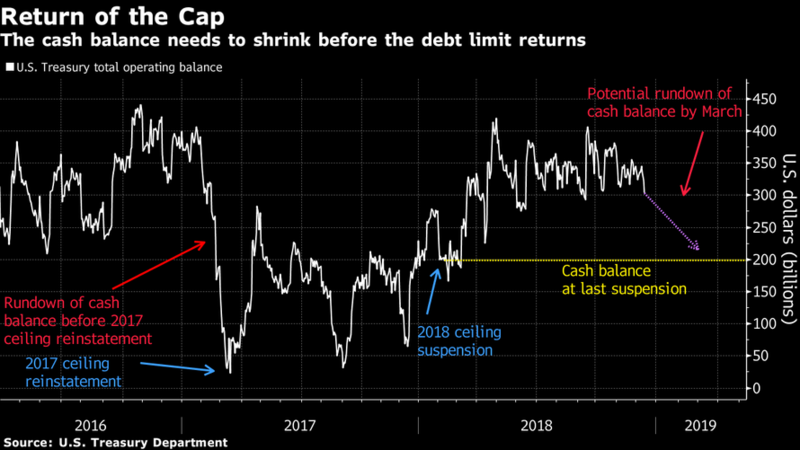 One silver lining this time around is that Treasury won’t have to whittle down its cash balance as much as in past episodes, a product of the size of its balance at the time the debt-ceiling moratorium was implemented. Nobody knows exactly when the Treasury's "extraordinary measures" would run out, as the 2017 tax overhaul has made it difficult to estimate the pace of government revenue, according to Jefferies LLC economist Thomas Simons, who expects a drop-dead date anywhere from mid-2019 to as late as the third quarter. Further complicating matters, according to Simmons, is the incoming Democratic leadership in the House may begin to focus on impeachment proceedings against President Trump. "The worry is that the debt limit is something that Congress lets slips through the cracks."